The 2019 Audi A7 is a 5 passenger Automatic transmission, 4-door Mid-Size Passenger Car. It is available in 3 trim packages, the Premium, Premium Plus, and Prestige. The new Audi A7 invoice price ranges from $63,920 to $63,920, while MSRP ranges from $68,000 to $68,000. 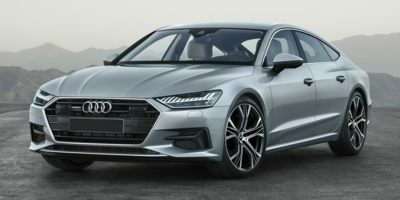 The 2019 Audi A7 is available in 14 exterior colors, Avalon Green, Brilliant Black, Carat Beige Metallic, Daytona Gray Pearl Effect, Firmament Blue Metallic, Florett Silver Metallic, Glacier White Metallic, Ibis White, Mythos Black Metallic, Soho Brown Metallic, Tango Red Metallic, Triton Blue, Typhoon Gray, and Vesuvius Gray Metallic, and 4 interior colors, Black w/Rock Gray Stitch, Okapi Brown w/Steel Gray, Pearl Beige w/Agate Gray, and Sarder Brown w/Rock Gray.